Volatility (VLT) is indicator in technical analysis which is statistical measure of volatility called coefficient of variation. It is calculated using two other indicators: standard deviation (SMD) and standard variance (SMV). Default value for SMD and SMV period is 21. Volatility is not indicator which is used for creating buying and selling signals, it is more used as confirming indicator. 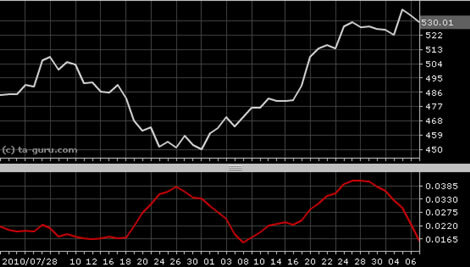 Open chart for google with volatility indicator.